Members of the Ancient Arabic Order of the Nobles of the Mystic Shrine for North America are members of the Masonic fraternity and adhere to the principles of Freemasonary – brotherly love, relief and truth. Freemasonry dates back hundreds of years to when stonemasons and other craftsman on building projects gathered in shelter houses or lodges. Through the years, these gatherings changed in many ways until formal Masonic lodges emerged, with members bound together not by trade, but by their own wishes to be fraternal brothers. There is no higher degree in Masonry than Master Mason (the Third Degree). A man is a fully accepted “Blue Lodge” Mason after he has received the first three degrees, known as Entered Apprentice, Fellow Craft and Master Mason. However, for Mason who would like to receive additional instruction and explanation regarding the allegory and symbolism learned in the Masonic Lodge, the Scottish Rite and York Rite bodies elaborate on the basic tenets of Freemasonry. To be eligible to petition for membership in the Shrine, a man must have achieved the Master Mason degree. Thirteen Masons organized the first Shrine Temple in 1872 – Mecca Temple in New York City. Its founders adopted the middle-Eastern theme with its colorful pageantry as a backdrop for the fledgling fraternity, knowing that surrounding their fraternity with mystery and intrigue would help draw the interest of new members. The new fraternity was envisioned as a fraternity was envisioned as a fraternity in which Masons could celebrate their brotherhood camaraderie, enjoying life in the company of like-minded Masonic brothers. The most visible symbol of Shrinedom is the distinctive red fez that Shriners wear at official functions. Shriners are distinguished by an enjoyment of life in the interest of philanthropy. The fraternity’s members enjoy parades, trips, circuses, dances, dinners, sporting events and other social occasions together. Beneath all the fun, Shriners support what has become known as the “World’s Greatest Philanthropy,” Shriners Hospitals for Children. 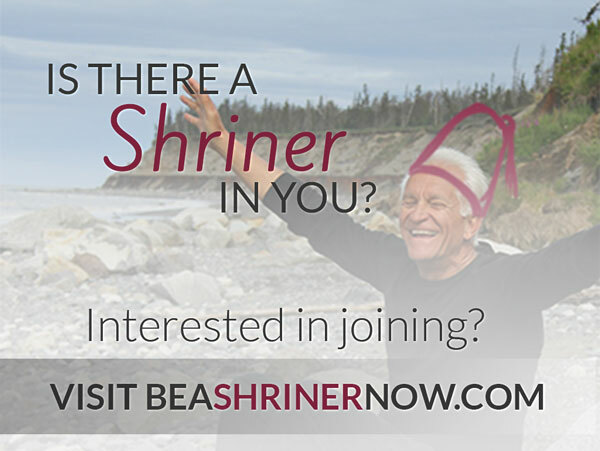 Members from all walks of life and all levels of income find fun, fellowship and relaxation in Shrinedom and its activities. Today, approximately 515,000 Shriners belong to 191 Shrine Temples, or centers, throughout the United States, Canada, Mexico and the Republic of Panama.